CAR2GO launched in Miami during the Summer of 2012. 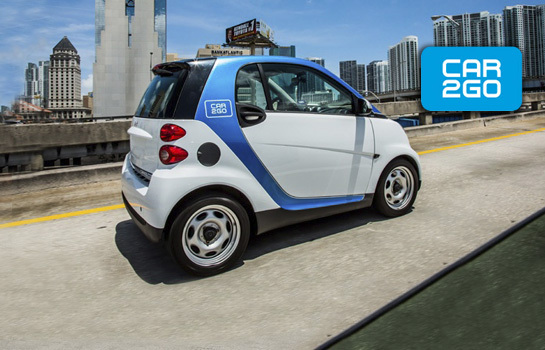 Today, the fleet of Miami CAR2GO is made of more than 200 free-floating vehicles throughout Miami-Dade County. The accident that occurred this morning is the first reported fatal accident in South Florida involving a CAR2GO vehicle. Questions have already been raised as to whether alcohol played a role in the crash and whether the CAR2GO driver was under the influence at the time he drove off with the SMART car. 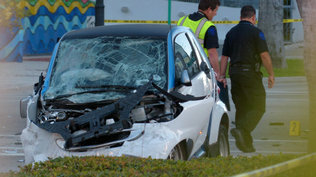 If the facts leading up to the accident are verified and the CAR2Go driver caused the death of his passenger and the pick-up truck driver to be paralyzed for life, several questions will have to be raised pertaining to the CAR2GO business model and its admittedly insufficient insurance coverage in case of injuries caused by one of their members. On its website, CAR2GO discloses that its liability insurance coverage is limited to $100,000 per person/$300,000 per accident for bodily injuries. The Graves Amendment, 49 U.S.C § 30106, preempts Florida Statute § 324.021(9)(b)2 (2007), thereby insulating rental car companies from vicarious liability while engaged in the trade or business of renting or leasing motor vehicles. In lay terms, rental car companies cannot be sued for injuries caused by the driver of a rental car under the Florida’s Dangerous Instrumentality Doctrine and the application of the vicarious liability laws. The Graves Amendment targeted leasing companies as well as car rental companies with the embedded understanding that a rental agreement would last at least 24 hours. At the time the Graves Amendment became law (2005) and at the time the Florida Supreme Court ruled on its application versus Florida Law (2011), the CAR2GO business model was not in existence in Florida. Some would argue that CAR2GO should be insulated from any liability in the accident that occurred this morning, pursuant to the Graves Amendment. However, there would be several significant legal arguments to be made pertaining to the difference in the business model that the Graves Amendment attempted to protect, and the free-floating model launched in 2012 in Miami by CAR2GO. In response to the potential protection under the Graves Amendment, a serious question must be asked: Why hasn’t CAR2GO implemented an alcohol ignition interlock system for its entire fleet of vehicle? It is very foreseeable that an inebriated CAR2GO member leave a club or social event and decide to use a CAR2GO vehicle. The entire business model is based on a car being always available to its members, and available everywhere. By definition, installing an alcohol ignition interlock system on all its vehicles would prevent the exact accident that occurred this morning downtown Miami. What is an alcohol ignition interlock system? It is a is a mechanism, like a breathalyzer, installed on a motor vehicle’s dashboard. Before the vehicle’s motor can be started, the driver first must exhale into the device; if the resultant breath-alcohol concentration analyzed result is greater than the legal blood alcohol concentration, the device prevents the engine from being started. This system should have been installed on every single CAR2GO vehicle, and had it been installed on the vehicle used at dawn this morning, three lives and families would not have been shattered forever. In addition to an alcohol ignition interlock system, questions of potential negligent entrustment must be raised. Over the last three decades, Leesfield Scolaro has represented many victims of rental car accidents, whether they were innocent bystanders or catastrophically injured passengers. Visit the Leesfield Scolaro website to learn more about our firm and results our personal injury attorneys obtained on behalf of injured victims.